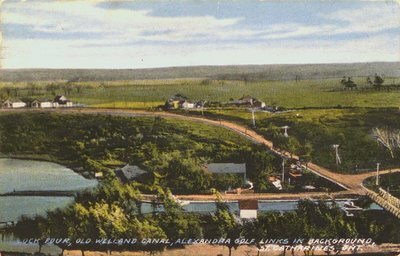 A postcard of Lock 4 of the Old Welland Canal (Second) with Alexandra Golf Links in the background, St. Catharines, Ontario. c1900-1910. Published for The Bookshop, St. Catharines, Ontario by F.H. Leslie, Niagara Falls, Canada. Printed in Germany.